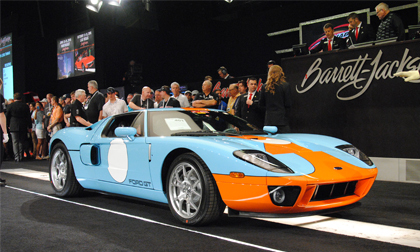 PALM BEACH, Fla. – April 11, 2016 – Barrett-Jackson, The World’s Greatest Collector Car Auctions®, sold over $23.2 million in collector cars and automobilia while attracting dramatically more bidders and attendees during its 14th Annual Palm Beach Auction. This year’s Barrett-Jackson Palm Beach auction increased sales over 2015 with a higher average vehicle price in front of 65,000 people over three days. Among the increased number of bidders in attendance, 42 percent of them were first-timers. The popularity of the collector car event continues to climb. Over the three-day event, the number of bidders increased from 2015, including 42 percent of them being first-timers. The Palm Beach Auction reached a broad international audience as Velocity and Discovery broadcast live for 19 hours in the USA and Canada. Viewers in the United Kingdom caught 10 hours of live auction action on Discovery Channel U.K. and Discovery Turbo making the live broadcast available to more viewers around the world than ever before. One of the reasons for the surge in interest in original cars in Palm Beach is the respect for Barrett-Jackson’s expertise in the industry and the presence of the most recognized experts in their respective automotive fields. Hollywood megastar, William Shatner arrived on Friday to auction his 2002 Aston Martin DB7 and 2004 Volkswagen Phaeton. After the legendary actor transported his star power and humor to the stage, he autographed the cars for the winning bidders. Country music artist Zac Brown, who headlined the 45th Anniversary Scottsdale Gala, joined in the celebration at the Palm Beach’s Opening Night Gala and NASCAR superstar Kurt Busch flew in for Sunday’s action following his race in Texas on Saturday evening. Barrett-Jackson will host its inaugural Northeast Auction at Mohegan Sun Resort & Casino on June 23-25, 2016. For information on consigning a vehicle or becoming a bidder at the Northeast Auction, please visit www.Barrett-Jackson.com.